January 25, 2017 — It was the scene for the unmasking of a monster. 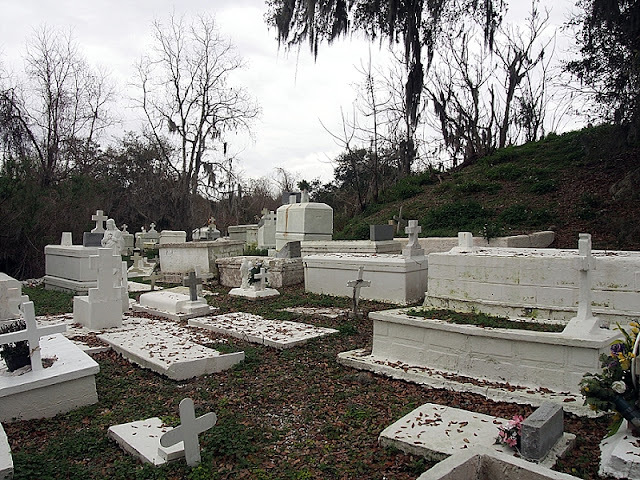 Not from a Scooby Doo episode, although the hidden, rural Louisiana graveyard on the banks of the muddy Bayou Barataria would have been perfect for that. No, this was a scene somehow weirder than one with a talking Great Dane and a group of innocent-seeming kids obviously running from some shared horror of their past. I’m talking about an important scene from True Detective Season One, that weird-fiction buddy-cop procedural that made me sell my TV because peak show had been reached. The series was set and filmed in Louisiana, so when I found out I was going to be in that swamp of a state, I put a filming location on the list. It was Carcosa, the city invented by author Ambrose Bierce that was reinterpreted in the show’s climax as the hidden enclave of a cult of high-ranking mystical murderers and pedophiles. In real life, the crumbling, root-pierced tunnels of Carcosa are part of Fort Macomb, an early 19th century garrison located at the edge of New Orleans. After I found myself in the Pelican State, however, I learned that the fort’s been abandoned since 1871 and is, unfortunately, closed to the public (although not to Beyonce). That made it slightly too trespassy and dangerous for a mere dude such as I.
Fortunately, while I was in New Orleans, I met a local OTIS reader named Mari. She had a family pass to St. Louis Cemetery No. 1, saving me from having to take an official tour of the place. It’s a story I’ll tell later, but just know that while Lindsey and I were spending a wonderful day with her in New Orleans, she tipped me off to Fleming Cemetery. Oddly enough, she had never seen True Detective. She just though it was a cool cemetery that I should visit. 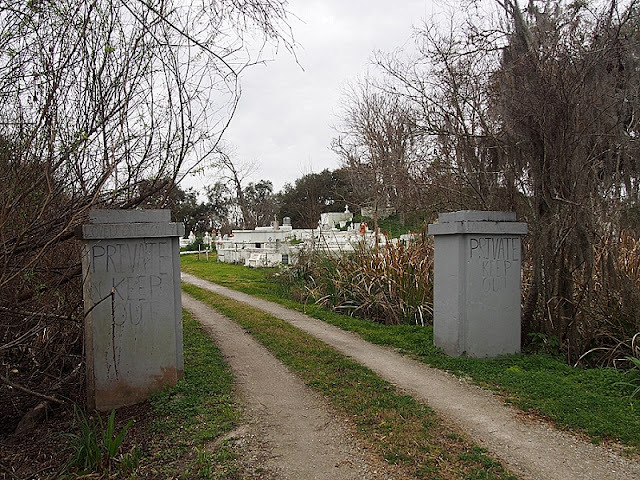 Fleming Cemetery is 20 miles south of New Orleans, in Jean Lafitte, a town named after a pirate. Operating under the assumption that we were probably loved by somebody on the planet, we passed through the gates…and into one of the more unique cemeteries I’ve been privileged to visit. I could call the place a pile of graves, and be accurate. But, like a polite asteroid, I would miss the atmosphere by miles. It was small, and the tombs were mostly white, oblong boxes set atop the ground and crowned by matching crosses. They were also, with some exceptions, clustered around the base and sides of a single tree-topped hill that rose 12 feet from the clearing like it itself marked a giant grave. The hill is actually a Native American mound, probably a midden pile of old oyster shells from ancient feasts. 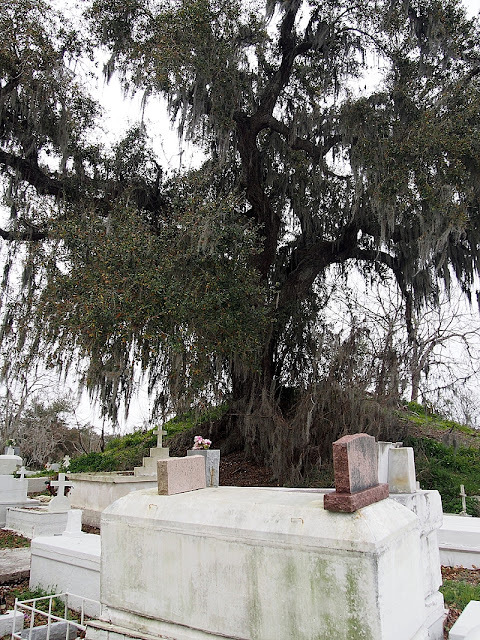 Spanish moss flowed from the limbs of a massive live oak on the mound, and just feet away was the Bayou Barataria (French for “dishonesty at sea”), draining from Lake Salvador. Atmosphere, man. Some of the tombs were startlingly white, as if they’d recently painted. And they regularly are, for All Saints’ Day on November 1. 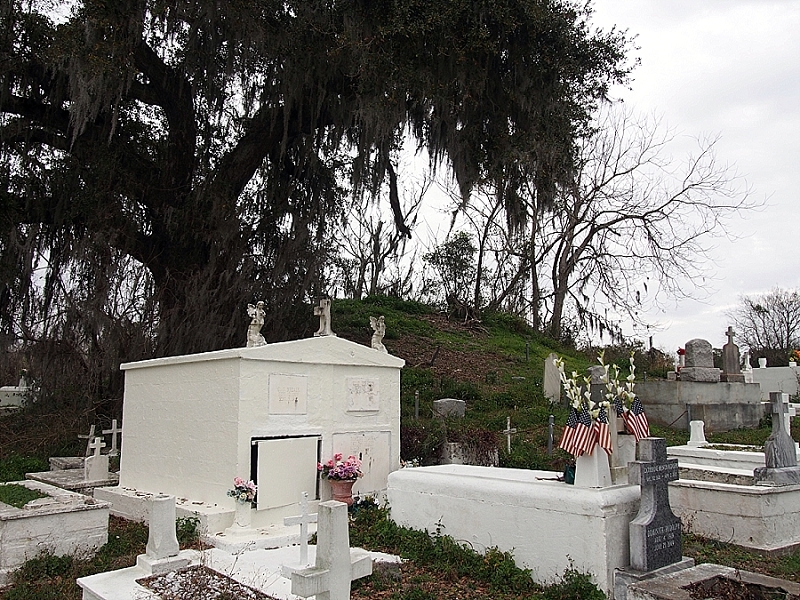 There’s also a legend that Jean Lafitte is buried there. He’s a pirate. And he’s also not buried there. Don’t tell the town. Still. Atmosphere, man. 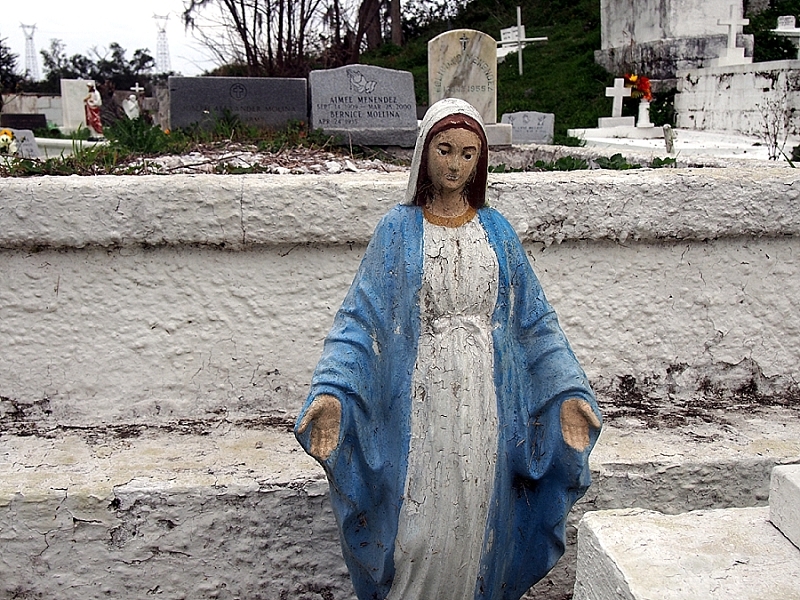 Beside the collection of graves was a clearing—flat, grassy and tomb-free. 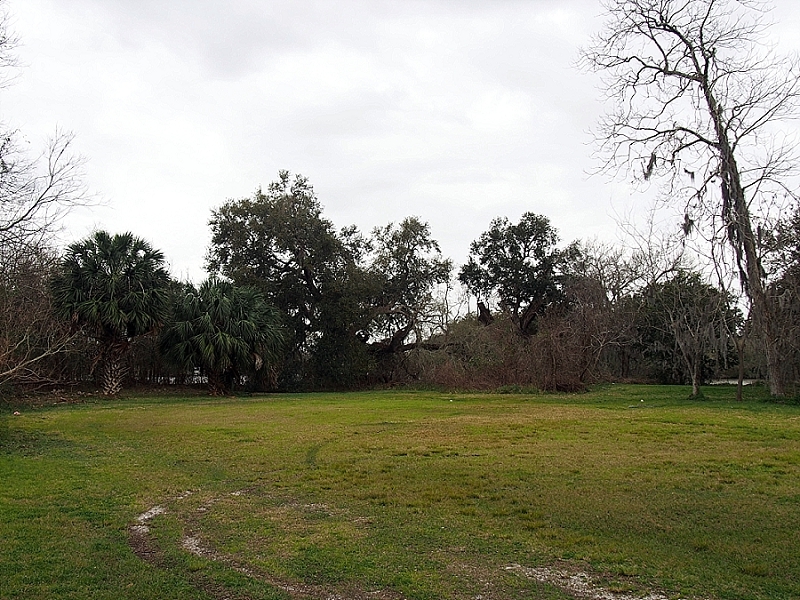 This was the spot being mowed by Errol Childress in Episode 7 of True Detective Season One, when the setting sun reveals to the audience the telltale facial scars that identify him as the spaghetti monster. Here’s the scene. Even features a nice crane shot of the cemetery. Incidentally, the direction the detectives’ car was facing in that scene was toward the cemetery gates. That means they faked like the cemetery was on the side of a road, when in reality there was nothing behind the car but a dead end and some palm trees and scrub brush. You can kind of tell in the crane shot. Movie magic, man. Of course, I climbed to the top of the Native American mound, where I found the grave plots of the brothers Berthoud, William and James, for whom the cemetery was named before becoming Fleming Cemetery, after a local plantation. The Berthouds owned the land that became their final resting place and were buried there in 1888 and 1890, respectively. They were the nephews of bird-guy James Audubon. I’m getting all this amazing information from this page. While I stood there, high above the dead, high above the water line, high above treasured aboriginal garbage, a small motor boat buzzed by below in the bayou. That reminded me of something else that I had read about the place. 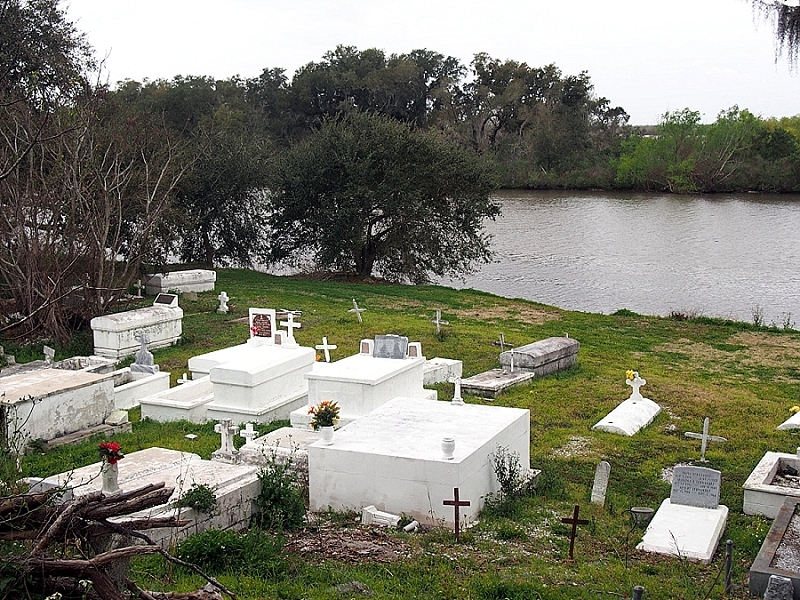 In the past, the dead were sometimes brought to this cemetery by a funeral procession of boats. Atmosphere, man. I say this regularly about the oddities I visit, but this was a place that was hard to leave. Really hard to leave. I would have liked to have seen sunset there, the dim orb staining the brown and green bayou and the white tombs red and orange. Listening to the night birds and insects. Pontificating on life like Rust Cohle after eight Lone Star beers. So let me summarize. 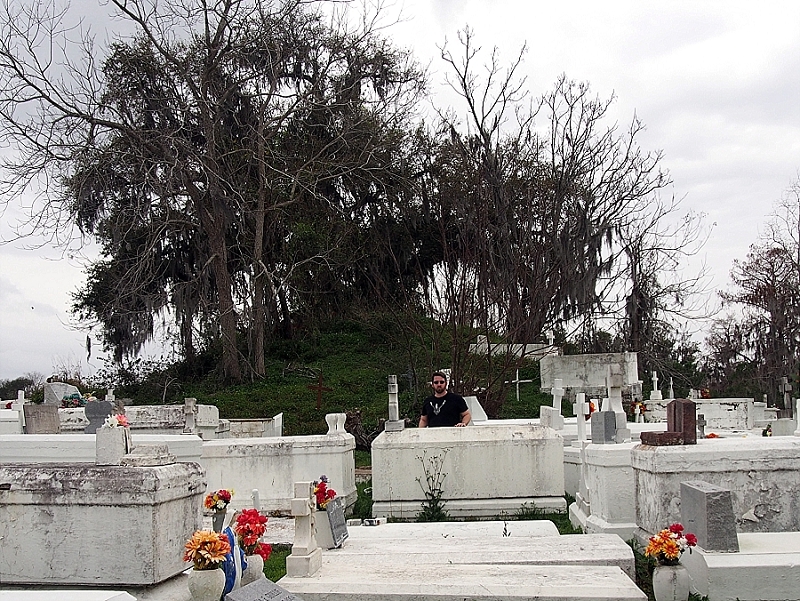 Fleming Cemetery is a cluster of graves on a Native American mound on the shores of a Louisiana bayou with a pirate legend and a pivotal cameo in a show with Woody Harrelson’s greatest performance since White Men Can’t Jump and Matthew Mcconaughey’s best performance since Texas Chainsaw Massacre: The Next Generation. Atmosphere, man.